What other species does one associate with prairies? I don't want to get pulled into technicalities but a great number of species use prairies and also savannahs. Birdwise- everything from Eastern Kingbirds, Dickcissels, Sandhill Cranes, Swainson's Hawks, Franklins' Gulls, Grasshopper Sparrows to Scissor-tailed flycatchers, Spragues' Pipits, Mountain Plovers, LeConte's Sparrows and Yellow Rails to name just a very few. Each of the many species finds a niche to utilize and become "experts" in foraging in that partition of habitat. Off the top of my head, there must be 200 species of birds that use prairies, 40 to 60 more species of mammals, I’d bet hundreds of species of butterflies and maybe a thousand species of insects. However, there are certain species which scream out their specific ties to prairies, Regal Frittilary Butterfly is one and Greater Prairie Chickens too. 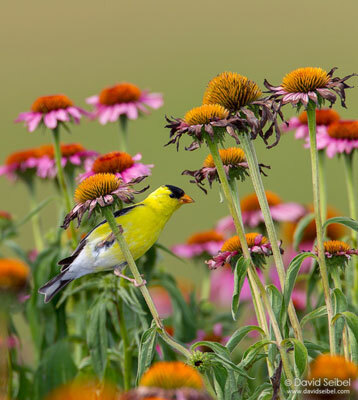 Why are these species important to prairie health? Well, it is because each species does things slightly differently. Even within a genus like Tympanuchus (the prairie grouse genus) Lesser Prairie Chickens are adapted to take the desert conditions better, Sharp-tailed Grouse endure the cold and can really thrive in more close forest situations because they feed on buds so much more. Greater Prairie Chickens are great seed eaters in winter, shift to tree buds when needed, probably ate smaller acorns at times, and shifted to insects in spring and summer. Say Scissor-tailed Flycatchers are nesting. They are feeding not only in slightly different ways than Eastern or Western Kingbirds but also they are selecting a slightly different mix of prey items too. As ecologists, we tend to think of habitat as these defining parameters-which is really a great model- but the prey/ food items or plant food resources are also really important in demonstrating what a species takes from a prairie and how each species gives back to the system. If you hang around me long enough you're going to hear me refer to the Web of Life a lot. I just love that concept. Webs are inherently really strong material. The design is simply brilliant on top of that, and then you begin to see the patterns of how each strand holds and supports the other strands and then you begin to understand the significance of a system. The moths and microbes are really just as important to the overall health as the Prairie Chicken- but no one cares about saving a prairie for the decomposers. Does any single species speak more to prairie health than others? Probably not. But look at it this way. You can plant a diversity of grasses, wild flowers and forbs and you have a technical prairie. The insects and birds will then begin the refinement process. If you look at it even a small patch of prairie can be "healthy". But what we are really talking about are self sustaining ecosystems which don’t require enormous amounts of human manipulation or management. Maybe a fire on 1/3 of the acreage each year. The concept is that some species, especially Greater Prairie Chickens, do need space. To me, if I have a prairie in the Midwest and I got Henslow's Sparrows- that is exciting. If next year I found Upland Sandpipers, my excitement grows. Let’s just say the neighbor leaves and I was able to buy the land. After another year or two Short-eared Owls show up, N. Harriers may be nesting in a wetter area and Bobolinks begin to stop each year in migration. These are really great signs that the diversity is growing and that the restoration is progressing nicely. Nature gives you great feedback. But the real glory - that Lifetime achievement award - well that is when a Prairie Chicken shows up. Then you have really accomplished something. Are there species that are less adaptable to ecosystem changes that would probably disappear without broad expanses of prairie? Eskimo Curlews are gone. We will never fully know the full dependence on the swarms of Rocky Mountain Locusts. We know they migrated up the prairies in spring by the millions. Like so many other species, people at that time considered them to be inexhaustibly abundant. Manifest Destiny again. Millions of Golden Plovers; numbers of birds we can not understand. I mean, I don’t think we even know how much Passenger Pigeons used prairies, but they must have to some degree. I mean to turn this around on you. Do we just want flocks of Horned Larks and blackbirds? Starlings are great adapters and push out tons of our native birds. If every Bluebird house was full of Starlings, who would miss the soft calls of our beautiful bluebirds. I think the first wave of the pending extinctions has occurred in the late 1800s due to our lack of awareness and understanding. Now the problem is ignorance. Now, we know what is happening and half or more of the world is stuck in denial or ignoring it. And I think we as species are highly adaptable. We've filled every niche so we create habitats to our liking and then complain if a species can’t adapt to us. What is the crisis? It sounds like you are telling us that there a lots of Prairie Chickens. So why do we need to be concerned? I think we are going to have to do an entire page on this one. Quickly - there is at this moment one state, ONE - and that is Nebraska where Greater Prairie Chicken numbers are holding quite steady. It is complicated but it is because of the delicate nature of the sandhills habitat and the fact the soils allow water to pass really almost straight through to the Ogallala aquifer that has allowed such a vast area to remain unchanged. Now, that huge block of habitat is the last stronghold for Greater Prairie Chickens and allows us to hold hope for a long time. If anything happens to the sandhills or changes how that habitat can be abused, then you have an instant endangered species. The thing that is important to take away is the fact that this is the margin of the range. People talk about populations shifting westward. That is crazy. That habitat is not substantially different than it ever was. Sure there are grain fields in the river valleys, but just think what would be going on in Iowa, Illinois and Missouri if we restored a couple of hundred thousand acres in each state. I mean we'd have enormous response by the birds and you wouldn’t have to spend any money on them. The past 25 years in Minnesota showed us this. I will finish with one more thought here. Having grown up in Missouri in rural communities, folks are very impressed with 5 or 10,000 acres. My neighbor here in Montana has 30,000 acres on his place. Down the road within 50 miles are at least three privately owned ranches of 100,000 acres or more. The biggest I know of close by is 275,000 acres. Probably, there are some ranches of a million acres in this state. Montana is only 4 times as large as Missouri, but the attitude of what is big is a totally different frame of mind.